10th April 2019, The National Coastwatch Institution station at St Ives is celebrating its 20th anniversary this year. For two decades volunteer watchkeepers have monitored boat movements, the activities of water sports enthusiasts, beach-goers and cliff-walkers from 7.30am to 6pm every day of the year. Watchkeepers monitor marine activity around St Ives bay to provide an early warning system to summon help to anyone getting into difficulties. NCI members will be celebrating with a buffet at the West Cornwall Golf Club in August and, in the meantime, their fund-raising will continue. Station Manager Helen Simpson said: "We are always delighted to receive donations and would love to hear from anyone who could help with organising fund-raising events for us." As a voluntary organisation, St Ives NCI has to raise its own funds through donations, public collections and its successful book store adjoining the watch station on The Island. NCI St Ives 20th anniversary coincides with the National Coastwatch Institution marking 25 years since its formation, after the closure of a number of coastguard stations around the UK. In the 25 years since the first station opened in 1994, the charity has established 52 watch stations around the UK coast with many more planned. The 25th National anniversary will be marked by a visit to Cornwall, later in the year, from their patron, The Princess Royal. 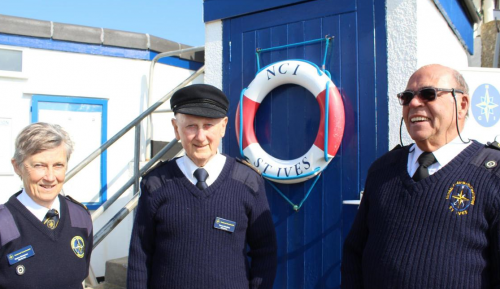 The photograph (courtesy of the St Ives Packet) shows Trevor Hoskins (centre) and Geoff Langford (right), the two founder-members of NCI St Ives who are still serving as volunteer watchkeepers 20 years later, pictured with station manager Helen Simpson.